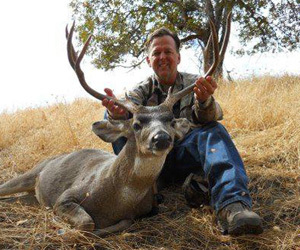 The BEST Upland & Big Game Hunts! hanks Ric and Red Bank Outfitters for making all of my hunting dreams come true! My Story begins in May 2008 when I was diagnosed with stage 4 colon cancer. Soon after diagnosis, my colon ruptured and I went into a coma for 6 weeks and spent 5 months in the hospital recovering. Having been bed ridden for so long, I had to learn to walk again and get my strength back. I then started undergoing Chemo & Radiation treatments. The Chemo has unfortunately left me with feet that are numb and in consistent pain. I wanted to get back to normal as soon a possible, so naturally I couldn’t wait to go hunting this year. I knew I would be deer hunting and have always dreamt of hog hunting and thought I would give it a try during deer season, but I knew that I would have some limitations because of my medical condition and the situation with my feet. So I embarked on the task of finding an outfitter. Sadly, many outfitters wouldn’t even work with me, but I finally thought I found someone so I booked the trip and one week before my planned hunt date, the outfitter backed out. Now in a hurry, I was searching the web and I ran across Red Bank Outfitters accidently while looking at bird hunting opportunities. I soon gave them a call, and a hunt was scheduled after a couple of conversations. Upon arriving at the lodge at about 3pm I was greeted by my guide Ric and within minutes we checked my rifle and were off hunting. Seeing no hogs and with shooting hours ending, we started to head back to the lodge. All of the sudden, two hogs jumped out and I blew an easy shot (Ric was very kind saying it was easy to miss because I was shooting off hand but I knew it was shooter error). That night I had a great meal and went to bed and probably slept for an hour thinking about the shot I blew… The next day’s hunt started at 5:30am when Ric arrived and we embarked on day two. 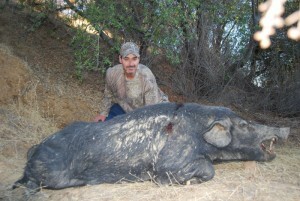 We drove to a different area and within 15 minutes of our hunt we had hogs everywhere and we went after one group. It seemed like forever before the hog presented a decent shot, and I was ready to come unglued but Ric kept me calm and I took my time and scored the hog of my dreams. I would like to thank all the great staff at Red Bank Outfitters. I had great service and a wonderful time. Discover all red bank has to offer. Catch up on the latest at Red Bank Outfitters.